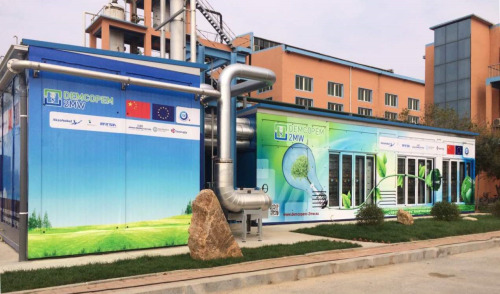 The world’s first 2 MW PEM fuel cell combined heat and power plant is now in operation at a chlor-alkali plant in China, as part of the EU-funded DEMCOPEM-2MW project. Three Dutch companies – AkzoNobel Industrial Chemicals, MTSA Technopower, and Nedstack – have delivered the world’s first 2 MW PEM fuel cell power plant. This large-scale combined heat and power (CHP) plant is now installed and operating at Ynnovate Sanzheng Fine Chemicals Co Ltd in Yingkou, China, and will add value to the ‘waste’ hydrogen by generating 2 MW of clean electricity for onsite use. The 2 MW fuel cell CHP system is located at Ynnovate Sanzheng’s chlor-alkali plant, at the Ynnovate Industrial site in the coastal city of Yingkou, in Liaoning Province. The fuel cell system will use by-product hydrogen from the chlor-alkali plant as fuel to generate about 20% of the power requirement for all of the customer’s production processes. No greenhouse gases are emitted in the process, making a substantial contribution to a greener environment. Nedstack and MTSA began work on the first 1 MW PEM fuel cell power plant – without heat integration – at a Solvay chlorine plant in Belgium in 2009, which entered full service at the beginning of 2012. (This unit has subsequently been transferred to the Caribbean island of Martinique.) The Chinese installation is a major next step towards the market for large stationary PEM fuel cell applications. In the project, AkzoNobel is responsible for communication with Ynnovate, MTSA has designed and constructed the fuel cell power plant, and Nedstack has supplied the PEMFC modules at the heart of the system. The other project partners are Johnson Matthey Fuel Cells in the UK, which manufactures the membrane-electrode assemblies, and the Politecnico di Milano in Italy, which is using its experience in modelling, data analysis, and process simulations to support the required process monitoring. The fuel cell CHP plant is the result of the DEMCOPEM-2MW project, supported by the EU-funded Fuel Cells and Hydrogen Joint Undertaking (FCH JU), in an international cooperation with China to demonstrate the MW-scale PEM fuel cell system in a real working environment. This four-year project began in October 2015, and runs to the end of 2018. The FCH JU is providing some €5.5 million (US$5.9 million) of the total €10.5 million ($11.3 million) project cost. The DEMCOPEM-2MW project will design, construct, and demonstrate an economical PEM fuel cell CHP system, producing 2 MW of electric power and 1.5 MW of heat, integrated into a chlor-alkali production plant. Such plants produce chlorine and caustic soda (lye), as well as high-purity hydrogen. The hydrogen represents almost 45% of the energy that is consumed in the plant, but in many cases this hydrogen is vented to the atmosphere. The PEM Power Plant will be fully integrated into the chlorine production unit, and is remotely controlled. The water produced by oxidation of the hydrogen is also used. The project will therefore demonstrate this technology for converting by-product hydrogen into electricity, heat and water for use in the chlor-alkali production process, lowering its electricity consumption by 20%. To reduce the maintenance costs of the integrated plant, there is a particular emphasis on fuel cell longevity (specifically the membranes, electrodes, and catalyst), and on reducing manufacturing costs. The design is optimised for minimal energy loss. Extensive diagnostics and data acquisition are incorporated to monitor performance. The consortium sees clear market opportunities for large-scale (2–6 MW) PEM fuel cell CHP generators to improve the overall efficiency of existing chlor-alkali or chlorine production plants in countries outside Europe with relatively high electricity prices, such as many areas of China. The presence of electricity shortages at certain times of the year (rationing) is also beneficial to the business case. A successful demonstration in China would create significant interest in the PEM Power Plant. The consortium believes that a market of between 20 and 50 units – each rated at 2 MWe or more – in the coming five to eight years seems realistic for China, which currently has some 180 chlor-alkali plants in service. Nedstack produces PEM fuel cells for stationary applications, such as telecom backup and PEM power plants, as well as for heavy-duty transport. Since it was spun out of AkzoNobel in 1998, Nedstack has deployed significant numbers of PEM fuel cell stacks around the world, gaining extensive experience on operation in different applications. The company has shown very long lifetimes of its PEM fuel cells. This article was originally published in Fuel Cells Bulletin, Fuel Cells Bulletin, November 2016.